Lily is no ordinary chicken. She dreams of a life off the farm, where she can put her grand plans into action. Her wish is granted when pirates recruit her and her fellow chickens and whisk them away to the open seas. Soon, Lily has taken charge and becomes captain of an all-chicken crew as the feared chicken pirate, Redfoot. But when Lily faces a mutiny, will she change her ways, or be forced to squawk the plank? 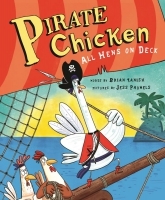 There's only one thing more frightful - or funny - than a band of pirate chickens: their feared and feathered leader, Redfoot.